My house is decorated in a style that's pretty simple and minimalist, so finding the right artwork to adorn my walls was always a struggle. To put it simply, I only wanted to decorate with things that made my heart sing and a smile cross my face every. single. time. I looked at them. So a few years back I started ordering large canvasses from photographs I took of my children. Since so many of you have asked about this I thought I'd start offering more products in addition to my digitals. But to really understand what you're getting, I wanted to put together a little side-by-side demonstration! First, I picked a few of my favorite colorful images and ordered them from a professional printer (sorry guys, you need a business license to use printers like this! so leave this part to me). To make it simple, I recommend the following four sizes: 11x14, 16x24, 24x36, and my favorite is 30x40. It's not very easy to take a picture of a picture, but in real life these babies look so. freaking. good! Like tears in my eyeballs, overcome with emotion, head over heels for these guys. Of course if you're local, feel free to schedule a time to stop by my studio and I'll show you these in person! In my opinion, these really look best when ordered at large size. The 11x14 is the smallest I'd recommend, and works best when paired with other sizes. I typically order this size when I'm giving gifts because grandma's got a lot of grandbabies so she gives equal wall space to each of the kids! 24x36 is the first size that starts to feel dramatic. Since I tend to shoot dramatic shots, this is the smallest I'd recommend for a statement piece. Especially one with a lot of negative space, or if you're trying to fit the whole family into one photo. 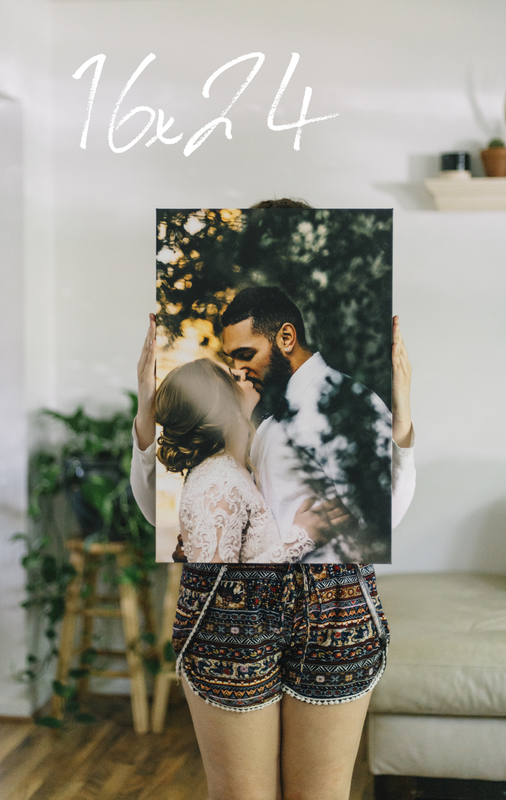 The 30x40 is hands down my favorite, and that's the size you'll see most frequently in my home!